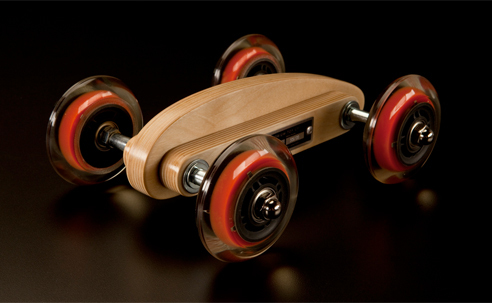 A beautiful re-imagining of wooden blocks and car toys. The little kits make it easy for kids to assemble their own car designs. The Boattail Racer from Auditorium Toy Co. The Boattail Racer from Auditorium Toy Co. is a work of beauty, standing far above the molded plastic extrusion of most modern toys. The wooden bodywork is sculpted from rugged 13 ply Baltic birch. The muscular stance comes courtesy of the 77.5 millimeter carnelian-core industrial grade wheels, which float effortlessly on precision bearings. Solid stainless steel axles and fasteners ensure faithful service for generations to come. Hat tip to Swissmiss for the link. Image courtesy of Auditorium Toy Co.
Holy walking coat hanger Batman! “In this project, we’ll build a little critter out of surprisingly simple, minimal parts. We’ll even make use of one of those coat hangers that seem to breed in the bedroom closet.” Check out the The Coat Hanger Walker for a fun little technical project.